Pastor Lesley Matschke was appointed to the Pine Bluffs United Methodist Church by Bishop Elaine Stanovsky and the Mountain Sky Conference. She officially began work on August 1, 2013 and she lives at the Pine Bluffs parsonage. She is in Pine Bluffs for five days a week and commutes on her days off (Monday and Tuesday) to Lakewood CO where she shares a home and time with her husband, George, her two daughters, Wendy and Marjorie, grandchildren and friends. George is a retired Wildlife Research biologist for the National Wildlife Research Center. He joins Pastor Lesley at intervals here in Pine Bluffs. 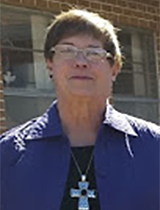 Pastor Lesley was a professional educator for thirty years in the Jefferson County Public Schools in Colorado. She taught sixth grade and outdoor Education. After retiring from the school district, Pastor Lesley answered her call to ministry and is now serving as a licensed local pastor in the United Methodist Church. She enjoys her time here in Pine Bluffs as a Pastor at the church and member of the community. She sums it up this way - "busy and blessed!"